So we recently had a board game night come to an abrupt and ignominious end some weeks ago, when Dastardly Donny inadvertently (or so we are led to believe) failed to understand the simple process of road movement in Conquest of the Empire, and subsequently fell for the ever-classic "Moroccan End-Around" strategy, being overrun by a sudden invasion of Egyptians swarming over the straits of Gibraltar, whilst I performed a crucial role in distracting his legions by letting them repeatedly pummel the crap out of me in Dalmatia. Of course the guidelines and ramifications for player elimination in COTE are far more brutal than in Axis and Allies or any of the other MB wargame brethren, so this master stroke essentially single-handedly gave the game's victory to our hapless pharoah, Notorious Nick. (I would have alerted Donny to his impending doom of course, were it not for the fact that Nick's gambit was my last remaining hope of fulfilling my ambitious strategy of "not coming in last".) In any event, we found ourselves suddenly abruptly gameless at far too early an hour on a recent saturday eve. Donny used this opportunity of course to slip off into the night to meet his Snuffelupagus-like "Magic" friends (which is why my suspicions to this day still linger as to the witting or unwitting nature of his pwning that night). Left with the time and opportunity though, Nick and I chose it as a prime time to try on one of the Battlegames and see what came of it. 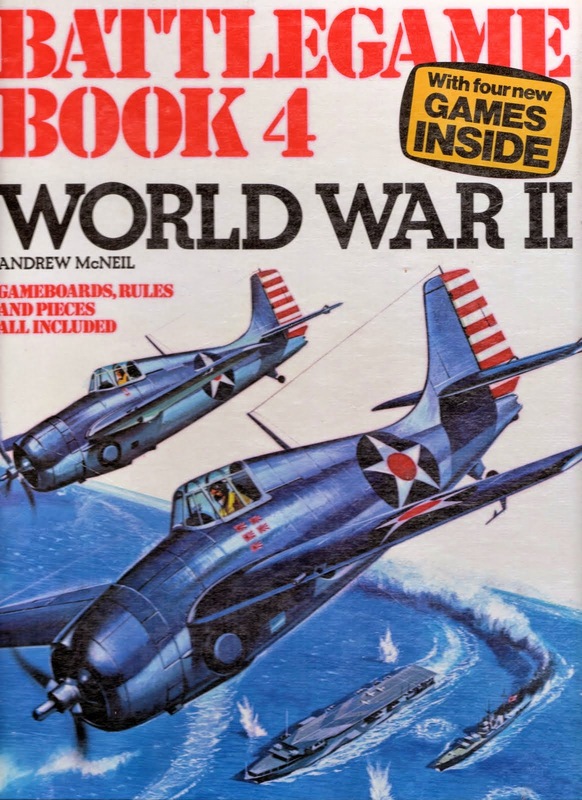 As this was sometime in early June, we went straight to the WWII book and delved into a selection called Beach-head. Now on one level, Beach-head is essentially the prerequisite D-Day simulation you would expect a WWII-oriented gamebook to cover. On a deeper level though, its agenda ultimately comes off as something entirely different. 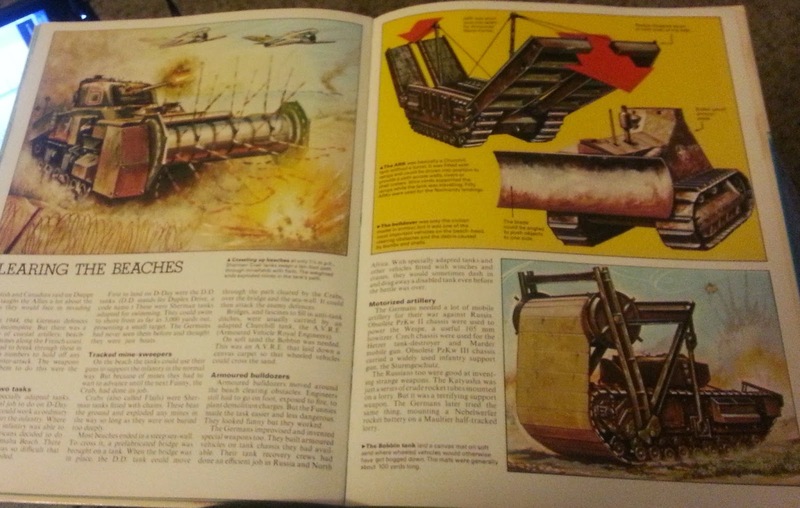 The game ties into a discussion of "funny" tanks and other engineering equipment in the book, and game play seems oriented to teach the young gamer about the various obstacles Allied troops faced and the tools they used to overcome them. The scene is Sword Beach on June 6, 1944. The German player (me here) defends, naturally, and begins setup by placing the heavy artillery in its designated space and then by determining which of the three possible gun emplacement positions will host the other two smaller anti-tank artillery units. I chose to place them to the left, reasoning that the two positions were closer together and, with the heavy piece on the far right, could better support each other through overlapping fire zones and lanes of approach. All other defending units must enter the board two at a time down the road from the village behind the beachhead, creating scramble as the game goes on for the German player to get his units in place to properly throw up a defensive screen. But although minimal units begin play on the board, the beach and the uplands are already covered with all nature of obstacles and seige defenses designed to thwart the Allied advance: minefields, barbed wire, ditches, concrete walls, "dragon's teeth" tank traps, and so on. Once the artillery is placed, the Allies land their first wave of invaders and the opening salvoes commence. 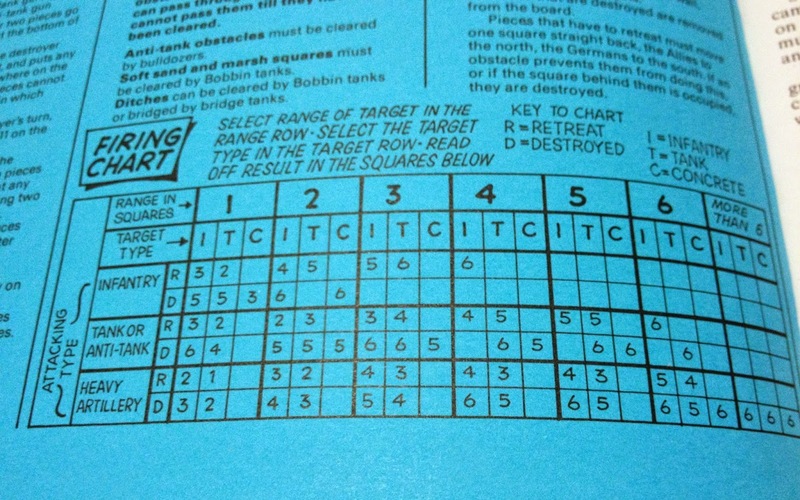 In addition to bombardment from an offshore cruiser, the Allied player places four units anywhere along the first row of squares on top of the beach each turn. The object itself is simple enough in theory. The Allies advance onto the board and have 12 game turns to get two tank units and two infantry to any of the squares on the far inland side of the board. Of course, while it sounds simple, it quickly becomes a logistical nightmare which is designed reward only the most organized of planners. For each line of beach obstacles the Allies hit, Nick is provided with a specific type of unit to clear it. The process it usually the same for all. The "funny" most move onto the obstructed square and remain there one turn. On the next move, that space is considered "cleared" and any unit may enter and cross it. (Bridging units are slightly different in that they must remain indefinitely in a river or ditch square to provide access.) Of course if the vehicle is taken out by German artillery before its task is complete, the square is remains obstructed and a new attempt must be started over next turn, meaning infantry lined up behind which had expected to cross is likely backed up on the beach and exposed to shelling. This is even further complicated by the fact that most of the "funnies" have no weaponry of their own with which to return fire.On his initial placement, Nick committed hard to an assault on my right flank, reasoning that one heavy artillery piece would be easier to land under than two medium pieces. He was not entirely wrong in that assumption. Once play began,the first few turns went quickly. His units crawled slowly up the beach while I rushed units in twos to various places along the defenses as well as possible. For a while the only units within range of anything were the heavy artllery and the cruiser, so combat was initially light. I had mild success in taking out some of the "funnies" as they worked, delaying his advance, but not as much as I would have liked. The board also became a chit-astic nightmare quickly. While most of the Battlegame series has a fairly limited number of pieces, there is a hell of a lot going on in Beach-head. Not only were the variety of "funnies" poorly labelled, we also needed to distinguish between those which had already used their special ability. At least for the types of units where that was relevant. In addition, we needed to find a way to mark which obstacles on the board had been cleared and were passable and ended up using black white scraps of paper for those. Ultimately though, part of the logistical nightmare faced by the Allied player in organizing his advance lies in simply remembering what is what on the board and trying to move pieces without knocking four others askew. Once the ground units got within range of each other, however, the scenario became the meat-grinder which I suspect it was partially designed to be. Nick successfully steered clear (for the most part) of my anti-tank guns, and managed to take out the heavy artillery with a hit from his cruiser maybe halfway or 2/3 of the way through. By that time, however, I had enough infantry and armor in place to fight tooth and nail, and, as his infantry and tanks slowly crawled up the beach, they were now under constant barrage. It took a heavy toll. I used cover provided by the obstacles as effectively as I could manage, keeping myself from being totally overwhelmed by Nick's superior forces, but eventually his advance did start to wear me down, particularly as he overran the large concrete wall constituting the large center defence. At that point it was easier for him to get units to the front line than myself (dealing with bridges and ditches behind the lines) and it was, I believed, just a matter of time at that point. The thing is though, time being an explicit victory condition of the game and all, it was enough. While I have no doubt whatsoever that, given a long enough timeframe, he would likely have steamrolled the meager units I had remaining, the Allies had We both looked at the troop placements at the beginning of the 12th turn and agreed there was no way he would be able to satisfy the victory condition of reaching the inland side of the board with the requisite units that turn. Nick felt the basics of the game were simple to pick up, whereas I felt the varieties of "funnies" were quite tricky to keep straight over the course of the game for both players. I am still unable to decide how exactly I feel about the insanely arcane firing table. While I'm appreciative of the added touch of complexity, it's on a level which is entirely out of character for the Battlegame series thus far, and it's one-pager rules paradigm. We both felt the premise was interesting, but Nick felt there was not much depth to the game and ultimately found the experience that much more frustrating after reaching the moment of truth where the Allied player realizes half his units are usless in combat. I was somewhat less peeved by the whole process, but felt there was still far too much emphasis on making the game educational in regards to the obstacles and their various "funnies" which detracted from the overall cool. We both had mixed emotions about the replayability of Beach-head. There are only a small variety of approaches and outcomes available to the scenario, but I still have half a hankering to see how it might play out with a different arrangement of starting artillery and the Allies landing on their right or center or across a broad front. We felt the game and the forces arrayed against each other were both very balanced. We both wondered why the victory conditions called for 2 armor and infantry units, and not just 4units of any type. The other question to my mind was if 12 turns is a reasonable time frame for an Allied victory at all, or if this limitation unreasonably favors the defender. The answer to that likely lies in the amount of time spent in the first few turns on "newbie" mistakes, if any, and whether a player having experienced the game already would have had the wherewithal to press inland faster. But that might just be like asking how many licks it takes to get to the center of a Tootsie Roll Pop.